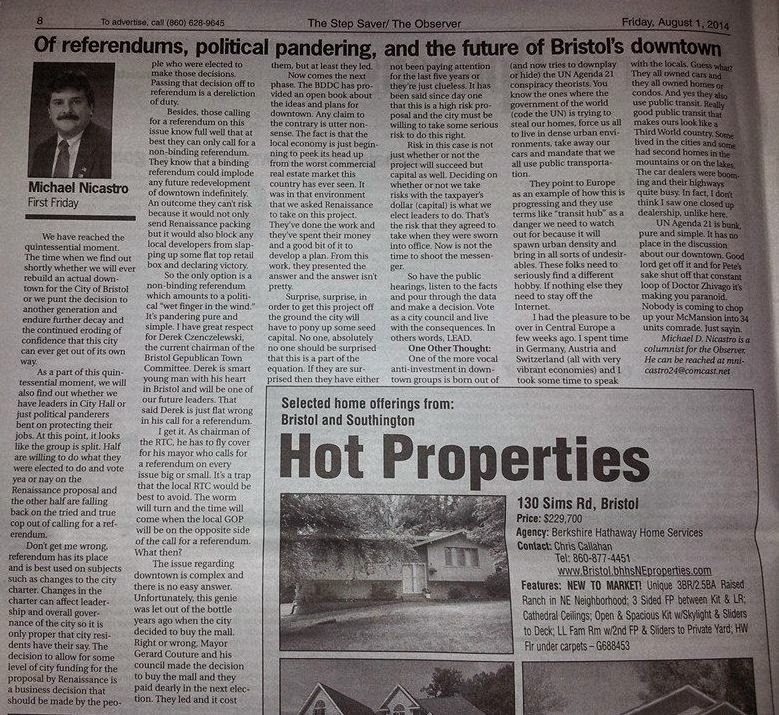 On August 1, 2014, former President of the Central Connecticut Chamber of Commerce, Michael Nicastro, wrote an article in the Bristol Observer where he criticized those residents, and elected officials, of the city of Bristol who are calling for a referendum, or a public vote, on the Renaissance proposal for the redevelopment of the downtown area. As a Bristol resident, I have my own views on referendums, as well as what I would like to see happen in the downtown area, however, I would like to use this posting to address another issue that Nicastro brought up in his article: United Nations Agenda 21. "One of the more vocal anti-investment in downtown groups is born out (and now tries to downplay or hide) of the UN Agenda 21 conspiracy theorists. You know the ones where the government of the world (code the UN) is trying to steal our homes, force us all to live in dense urban environments, take away our cars, and mandate that we all use public transportation"
Nicastro suggests that this group "seriously find a different hobby", "stay off the internet", and concludes by calling Agenda 21 "bunk", or nonsense, saying "it has no place in the discussion about our downtown". It is important to point out why Agenda 21, and its associated programs, and organizations, do have a place in the discussion of major redevelopment projects taking place across the state of Connecticut, including Bristol's downtown. If someone were to do a quick search, in an attempt to try to find an easy answer, in regards to the explanation of Agenda 21, they would most likely come across a description that simply explains Agenda 21 as a "non-binding, voluntarily implemented action plan of the United Nations". This sounds harmless, until you take the time to read Agenda 21, learn the principles, and find out how the recommendations are being implemented in your area. Many people do not have the time, or patience, to read, take notes, and analyze, all 351 pages of the Agenda 21 .pdf online document, as well as the associated conventions and reports. (Sidenote: The hard copy print version of Agenda 21 is also available through the United Nations.) The report A Critical Analysis of Agenda 21 - United Nations Program of Action was written, with quotes from the actual agenda, to give interested readers a summary view of some of the key points of the program. These key points include: the collectivization of land, the reduction of national sovereignty, population control, and much more. To give just one example of how this Agenda has made its way into Connecticut, we will use one of the other key points of Agenda 21: the reduction of private motor vehicles. In an effort to begin transitioning local development projects away from a focus on private motor vehicle use, Agenda 21 recommends governments promote the use of "non-motorized transport", "high-occupancy public transport", and "safe cycleways and footways". There are organizations in Connecticut, which have the same stated objectives as Agenda 21, lobbying the state legislature, in an attempt to pass laws, and regulations, that would conform to the agenda. Many of these organizations have direct connections with the people, and organizations, responsible for the creation of Agenda 21. One such organization, in the area of private motor vehicle reduction, is the Tri-State Transportation Campaign (TSTC). The TSTC describes itself as a "non-profit advocacy organization dedicated to reducing car dependency in New York, New Jersey, and Connecticut". As pointed out in the analysis Agenda 21 in Connecticut: The Tri-State Transportation Campaign, the TSTC is funded by many foundations with direct connections to Agenda 21, including the Rockefeller Brothers Fund (RBF). In an official document obtained from the RBF website, it is clearly described how the RBF has financially supported various climate change propaganda-efforts, including strengthening the implementation of Agenda 21 up to, and exceeding, the 1992 Earth Summit, the conference which resulted in the Agenda 21 document. Seeing as how most people can not be persuaded to give up their personal vehicle, voluntarily, a critical thinker should be asking how exactly these organizations, working in conjunction with local governments, plan on getting people out of their vehicles, and onto bikes, walkways, and public transportation. The answer is that they will force you out of your vehicle, by supporting laws, and regulations, that would increase the cost of owning, and operating, a private motor vehicle. This can be done in a number of ways, such as increasing the tax on gas, or cars, or increasing the overall cost of obtaining a drivers license. The Tri-State Transportation Campaign has their own tactics to increase the cost of owning, and operating, a private motor vehicle, which includes lobbying to have tolls put up on all Connecticut interstate highways, pushing for the state to install red light cameras at intersections across the state, and winning passage of legislation which increases the amount of traffic tickets given out by police officers. The main goal of CTFastrak, according to the State of Connecticut's official website, is "to reduce traffic congestion on I-84, which in turn will reduce energy use and air pollution." To the average person, "reducing traffic congestion on I-84" would mean expanding roadways and/or creating other roadways, but when the state's goal is to "reduce energy use and air pollution", that means they are looking to take/force many people OUT of their vehicle. A supporter of the busway, Connecticut Representative Tony Guerrera stated, in an interview with local news, that the real goal of the busway is about "getting people off of the roadway", and continued, "that was the most important. About 18,000 per day." I wonder if these bureaucrats like Rep. Guerrera plan on counting themselves as part of the 18,000 people that will willingly give up their personal vehicle, for public transportation? Important to note is the connection between CTFastrak and the Tri-State Transportation Campaign. Not only did the TSTC support the busway because it will take cars off the roadway, but the TSTC had also sponsored a trip for local, and state, officials, to visit areas where Transit Oriented Development (TOD) has already occurred, in an effort to persuade the officials to support CTFastrak. One sample area shown to the unnamed state officials was Lowell, Massachusets, where "smart policies have helped", according to the TSTC. The goal of this project is to "maintain the walkable environment", meaning "the city basically take[s] parking out of the development equation", according to Assistant City Manager Adam Baacke. In the city of Lowell, the article continues, "No parking is required for non-residential uses in downtown." As previously quoted, Michael Nicastro ridiculed the people who believe that there are plans to "take away our cars", however, it is obvious that the current government trend is in fact to force us out of our cars. Quite interestingly, Nicastro once gave a presentation which was critical of the CTFastrak busway, where he seemed to be aware of at least one government policy intended on reducing private motor vehicle usage, the Federal CMAQ Improvement program. In the presentation (video below), Nicastro mentions how the CTFastrak busway is partially funded through CMAQ funding, which is intended on reducing motor vehicle usage, or as Nicastro puts it "If you take carbon based automobiles and trucks off the road, you can get CMAQ money." "programs to limit or restrict vehicle use in downtown areas or other areas of emission concentration particularly during periods of peak use"
"programs to limit portions of road surfaces or certain sections of the metropolitan area to the use of non-motorized vehicles or pedestrian use, both as to time and place"
"restriction of certain roads or lanes to, or construction of such roads or lanes for use by, passenger buses or HOV"
"programs and ordinances to facilitate non-automobile travel, provision and utilization of mass transit, and to generally reduce the need for SOV travel, as part of transportation planning and development efforts of a locality, including programs and ordinances applicable to new shopping centers, special events, and other centers of vehicle activity; and programs for new construction and major reconstructions of paths, tracks, or areas solely for the use by pedestrian or other non-motorized means of transportation when economically feasible and in the public interest. " Of course, as previously pointed out, the plan is not to simply persuade you to reduce your vehicle trips, but to force you out of your vehicle, by making it too expensive to drive. In this context, the CMAQ program has suggestions which include adding tolls to roads that do not currently have tolls, taxing drivers by every mile that they drive, and more. The American Planning Association (APA) is another top level planning group that attempts to hide their affiliation with Agenda 21. The APA went as far as to put out a document titled, "Agenda 21: Myths and Facts", with misleading information, in an attempt to convince the reader that they have no affiliation with the United Nations, or Agenda 21, and that Agenda 21 "does not infringe on the sovereignty on any nation or the independence of the local planning process." Now that we have a basic understanding of how Agenda 21 makes its way into local planning projects, and the terminology used, let us explore the current downtown development proposal for the city of Bristol. Michael Nicastro tell us that Agenda 21 "has no place in the discussion about our downtown", however when we juxtapose the various documents that relate to the downtown project, with the terms earlier shown to be connected with Agenda 21, we can see a clear association. The APA associated Renaissance Downtowns is the organization that was designated by the City of Bristol as Master Developer for the Revitalization of Downtown Bristol Project in May of 2010. Renaissance has over ten billion dollars in downtown development agreements with local governments, throughout the east coast, and was looking to receive $6 million from the tax payers of Bristol, just for the first phase of their master plan for the downtown area, which includes the construction of new apartment buildings with a total of 100 units. The full master plan looks to concentrate thousands of housing units in the downtown area. Referring back to the quote by J. Gary Lawrence about having to call Agenda 21 by other names, "smart growth", and "comprehensive planning", are two more terms that are synonymous with Agenda 21, and the official website for Renaissance in Bristol has a section discussing, and advocating, "smart growth", which includes a section on "Comprehensive Planning as a Tool to Attract Funding". "The Presidential Administration and Congress, through their Sustainable Communities initiative amongst other efforts, is looking to award federal dollars to large scale, smart growth redevelopment efforts, especially those that focus on transit oriented development within our nation’s downtowns...With this in mind, a comprehensive downtown redevelopment designed to meet these objectives stands a far greater chance of receiving significant funding dollars and/or resumption of rail than smaller, isolated efforts. In short, the government is not looking to provide just streetscape grants and sidewalk benches – they are looking for transformative projects focused on our nation’s downtowns that will serve the triple bottom line of social, economic and environmental responsibility." Another Agenda 21 concept that is used in the Renaissance plan is the idea of "complete streets". Complete Streets is a program guide in the area of street construction, and design, which de-emphasizes the use of motor vehicles in it's planning designs, and attempts to include more 'sustainable' means of transport, like public transportation, bicycling, and walking. Complete streets legislation passed in the city of New Haven in 2008, after being lobbied for by the previously mentioned Tri-State Transportation Campaign. The Complete Streets design manual for the city of New Haven describes how "enforcement efforts are a crucial component to achieving safe, complete streets", and even encourages the police to issue more tickets to help the implementation of the program. The Renaissance concept plan also says that they "will employ the principles of complete streets", which will "reduce the need for use of the auto." The Renaissance plan says that "Bristol has very limited transportation options", and even bemoans the, in their opinion, high level of car usage in the city. The city of Bristol's downtown development plan is not an isolated project, as most people would think, instead, it is part of a much larger 'comprehensive' plan that stretches across many towns, and cities, as well as across the state border. As pointed out in the analysis, A Critical Analysis of Agenda 21 - United Nations Program of Action, Agenda 21 looks to override, or limit, the sovereignty of local democratic government, blurring, or even erasing, the existing boundaries that separate cities, municipalities, states, countries, etc., and create new, or strengthen existing, regional boundaries. The decision making authority of these regional organizations will supersede that of your elected governments. The power of these regional organizations comes from the authority granted to them to allocate federal, and state, grant money. Because these regional organizations control where the grant money goes, they are able to use this power to persuade towns, and cities, to go along with their plan, otherwise the town, or city, will have to pay for the cost of maintaining their infrastructure themselves, without receiving any of the resident's tax money back from the State and Federal government. "In those types of situations, the property tax burden on the individuals in the town that goes it alone can become very heavy. However, until the town reaches a financial tipping point where efforts to balance the provision of services with the cost of those services cannot be maintained, there may be little desire to seek out a regional solution. Only then will the town and its citizens be ready to give up some independence and join together with other towns for the provision of goods and services in order to stabilize or reduce local property taxes. " Let us take a look at some of the ever-expanding regional organizations that are continuously gaining more decision making authority, which are affecting the city of Bristol. Bristol is a member of the Central Connecticut Regional Planning Agency (CCRPA), which allocates federal and state grant money, as well as plans and promotes regional policies and programs, for two cities and five towns in the area. (Sidenote: Michael Nicastro is listed as a member of the Transportation Committee of the CCRPA.) Interesting to note, the thirteen regional planning organizations in Connecticut, will soon be merged into eight organizations, further separating and restricting the decision making power of local elected-government. It is important to realize that these regional organizations are not democratically-elected institutions. Giving more power to these type of non-democratic organizations, is another goal of Agenda 21, which views elected, local, public representatives, as a threat, because these representatives have the power to make, or change, laws, thus having the power to interrupt the Agenda. Local government making their own decision, or "unilateral policy action", is viewed as an endangerment to the system that is being set up. Agenda 21 calls for countries to "restructure the decision-making process" and "overcome confrontation" in order to "remove the barriers to progress caused by bureaucratic inefficiencies." It is not a coincidence that the Renaissance plan is very similar to the CCRPA's Long Range Transportation Plan, both having goals to create 'livable' cities, implement 'complete streets' policies, as well as other Agenda 21-related terms and concepts. The CCRPA has openly stated, in their annual report for 2012, that they have coordinated with Renasissance Downtown on the development of downtown Bristol. To blur the distinction of current borders even more, the CCRPA has become part of an even bigger regional organization called the Sustainable Knowledge Corridor. The Sustainable Knowledge Corridor is an area that covers 80 cities and towns, over 1.5 million people, and includes areas in Connecticut, as well as Massachusetts. The CCRPA has begun coordinating their regional plan, with the consortium of the Sustainable Knowledge Corridor. The Sustainable Knowledge Corridor was funded into existence when the Obama administration created the Sustainable Communities Initiative. The Sustainable Communities Initiative was formed out of a partnership of three federal agencies, U.S. Department of Housing and Urban Development (HUD), U.S. Department of Transportation (DOT), and U.S. Environmental Protection Agency (EPA). (As a side note, the previously mentioned Ray LaHood, was the secretary of the DOT at the time.) The goal of this initiative is to combine, and coordinate, federal plans of transportation, with housing, and environment, as well as develop 'livability'. The concept of focusing development around "key transit nodes", or Transit-Oriented Development (TOD), has been mentioned a couple of times in this analysis, but requires its own brief explanation, and connection to Agenda 21, Connecticut, and the downtown development of Bristol. TOD projects are being built in preparation for a future where the vast majority of people will be forced, by various increases in the cost of living, to move into multi-unit housing, along a transit line, whether it be bus, or rail. In the Connecticut section of the NY-CT Sustainable Communities Consortium's website, it is stated that through "transit-oriented development projects" these livable communities will "provide much of the area's job and housing needs for the next generation." [emphasis added] Notice the use of the word "much". Again, these livable communities are places where people will be forced, financially, to live in, and where mobility will be severely limited. "This vision for Hartford — and, largely, Connecticut — seeks to create a city where people can move around freely without cars, either walking or biking short distances while fully developed transit networks can take them longer distances inside the city and beyond. Driving a car, particularly without passengers, would be discouraged as parking, highway congestion, and the rising price of fuel makes it less economical." The previously mentioned CTFastrak bus line, and the surrounding development taking place, is an example of, and is described as, Transit-Orientated Development. In anticipation of a mass migration of people to this area, there are hundred-plus unit high-rise residential buildings being constructed along the bus route. Connecting this to the downtown Bristol project, Renaissance has stated that they develop TOD projects because they stand a higher chance of receiving federal funding through federal programs like the Sustainable Communities Initiative. The Renaissance downtown Bristol project is described as "transit oriented", and the CCRPA has designated the area as future a TOD site. The CCRPA has also helped secure funding for CTFastrak. The CTFastrak busway appears to be the means of transit that development will be oriented around in the area, as there is plans to have direct service to Bristol, stopping at City Hall, directly across from the Renaissance Depot Square Downtown project. This analysis is meant to provide a basic understanding, and explanation, of how the downtown redevelopment project in Bristol is part of a much larger vision being implemented at the state, federal, and international level, and not just an isolated project as many would believe. This larger vision is of a future world with extremely limited mobility, where the majority of people will be living in small, high-rise apartments, in densely-populated communities. To gain a greater understanding of this Agenda, an interested reader should follow the links provided, and read the suggested literature.